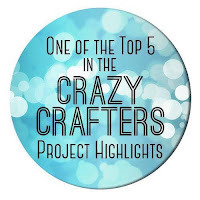 This card is entered into the Crazy Crafters Project Highlights for this week. 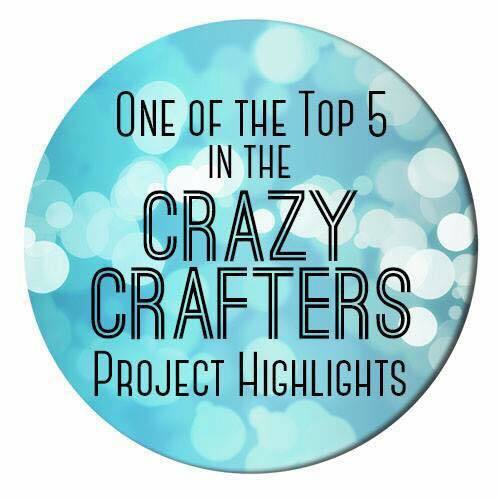 Click here to see all the amazing cards and vote for your favourites. I actually made two 30th Anniversary Cards - the other one was requested by a friend and I'll show it to you on 7th May! I'm not normally much of a "heart" person but this is the perfect occasion to use them. Stampin' Up product on the card - but just the perfect size for my needs! The card base is made from Elegant Eggplant to which I added a layer of Copper Foil Sheet. Since the middle of the sheet can't be seen and I love the copper foil too much to waste any, I always cut out the centre and just adhere a frame of the copper. 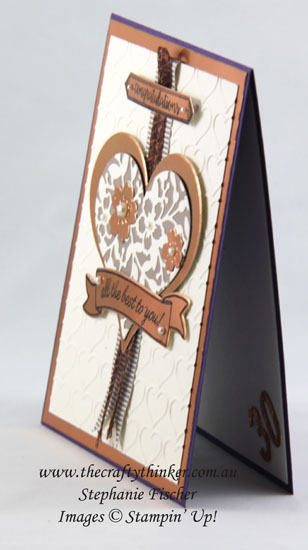 The Very Vanilla layer is embossed with the Happy Heart embossing folder (which is retiring). To this I loosely adhered a piece of Tip Top Taupe Mini Striped Ribbon. To that I added a looped piece of the new Copper Trim ribbon which is held in place by the decorations. I stamped the two banners and greetings onto Copper Foil Sheet with Basic Black ink and then waved a heat tool over it to ensure that it wouldn't smudge. The top banner is from the new Happy Birthday Gorgeous stamp set and it fits perfectly with the Classic Label punch. 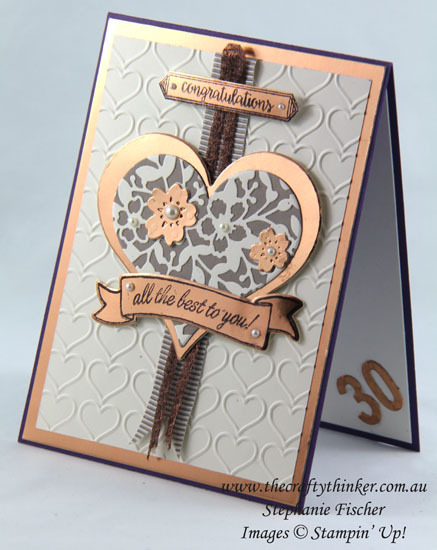 I used the Bloomin' Heart die to cut some Very Vanilla cardstock and adhered it to a scrap of Tip Top Taupe (a retiring In-Colour) cardstock before cutting it with one of the Sweet & Sassy framelits. I then cut a larger heart from Copper Foil Sheet with the same die set and layered them together, adding a couple of little copper flowers. Since this is a Pearl Anniversary, naturally, I had to add as many pearls as I could without going too overboard! The use of Stampin' Dimensionals and Foam Adhesive Strips gives... well - dimension!